When the news came that Charles Leroy “Buck” Simmons, one of the greatest short track drivers who ever lived, had died at the relatively young age of 66, my mind wandered back to a Friday night some years back, to a race at a track called Highway 106 Speedway in the north Georgia town of Carnesville. I was there to do a story on Buck, whom I’d known for years. He was closing in on 1,000 career feature wins. The first question most fans – and editors – would ask is how do you know he really has 900-something wins? I knew that question would be coming so I began digging through the data. His mother had kept meticulous records documenting hundreds of victories in his early days. I had enough records from my own reporting to cover about 550 wins. So I felt safe pitching the story to the editors at the big Atlanta newspaper. By this time in Simmons’ career, he wasn’t in the best of shape. He rode a golf cart to the pit area and back, and sometimes sat in his race car between practice sessions to avoid the trouble of climbing in and out of the window. He probably wouldn’t have been racing at all, had not his long-time supporter Gerald Voyles put him in a competitive car, knowing that he needed just a few wins to reach the 1,000 threshold. In qualifying, Buck was about eighth fastest. The track, like many 3/8-mile dirt ovals, looked to be a one-groove kind of place. With a photographer from the paper there, and representatives of a local TV station as well, I began to hope for Buck’s sake that he could at least salvage a top-five finish out of the night. If he went backwards, the story might never get anywhere near the section front or maybe not even in the paper. When the green flag flew to start his feature, he rode in eighth for a few laps. Then he knocked off seventh place. Then sixth. With the help of attrition and some bold driving, he kept moving up. When he got to third, the crowd began to appreciate what they were seeing. Many times, at a backwoods country race track, fans never budge from their seats, or show much emotion at anything short of fisticuffs. But as Buck continued his march forward, old men in tobacco-stained overalls began to stand and cheer him on. I was there supposedly as an unbiased journalist, but I soon found myself pulling for a great story to write, one about a man I’d followed for years before I ever got a newspaper job. When Buck muscled his way into the lead with just a handful of laps to go, it might as well have been Dale Earnhardt at the wheel. The crowd loved it. Afterward, long after the pits had essentially cleared and the crowd and the photographers had left the track, I asked Buck how he, in the poor state of health he appeared to be in, managed such a stirring performance. Simmons and I also talked about his brief fling in the series now known as Sprint Cup. In 1979 and 1980 he ran eight races. His best finish came in his first start, at Atlanta, where he was 14th. Simmons said he didn’t particularly like the bigger race tracks, but the real reason he kept his focus on short track racing was financial. “That NASCAR racing was about to leave me eating out of the garbage can,” he said. Indeed, his total winnings for eight races amounted to just $9,390. He won that much on many a weekend in his dirt cars. 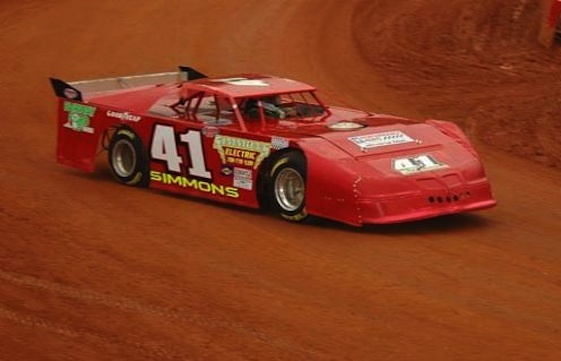 Racing never made Buck Simmons rich financially. It did provide him with a living for all but a few years of his life. He did cross that 1,000-win threshold, plus a few more to spare. You generally don’t consider dollars when determining whether someone was a legend or not. One thousand wins would be a factor for sure. Any way you add it up, Buck Simmons was a legend. ‘Buck Simmons Living Legend’ with over 300 photos . Watched Buck race for fifty years or so. Got to be one of the best who ever raced on short tracks especially dirt short tracks. And, he ran just about every major dirt track in the county including Eldora. No debate here. Buck was one of the best who ever drove. The asphalt days at Dixies Speedway were some of my biggest child hood memories. Where being at the track with my dad or my uncle Paul and his son Ken it seemed it always ended with Buck in his Max Simpson owned nothing runs like a deer Camaro in a close battle with Jody Ridley and his Jim Tidwell sponsored Falcon. Those are some wonderful memories of time spent with family and it definitely set the hook in me with the racing bug. my first trip to Dixie Speedway in 1971 was the first time i saw Buck race.I was 12 years old. The Late Model feature was a 100 lapper. The last 50 laps was a classic duel with Buck in the Max Simpson owned gold #41 Chevelle and Leon “slick” Sells in his blue #77 Chevelle. These two dirt track legends ran door to door lap after lap with first one then the other noseing ahead at the flag stand.Coming out of turn 4 to the checkers Buck got a little better bite won by a half car length. The thing i remember most was the two cars never touched despite being inches apart the majority of 50 laps. From that night i have been hooked on this crazy sport.Thanks for the memories Buck.